Watch out for Microsoft's "Essentials" bundle, which forces you to pay more. 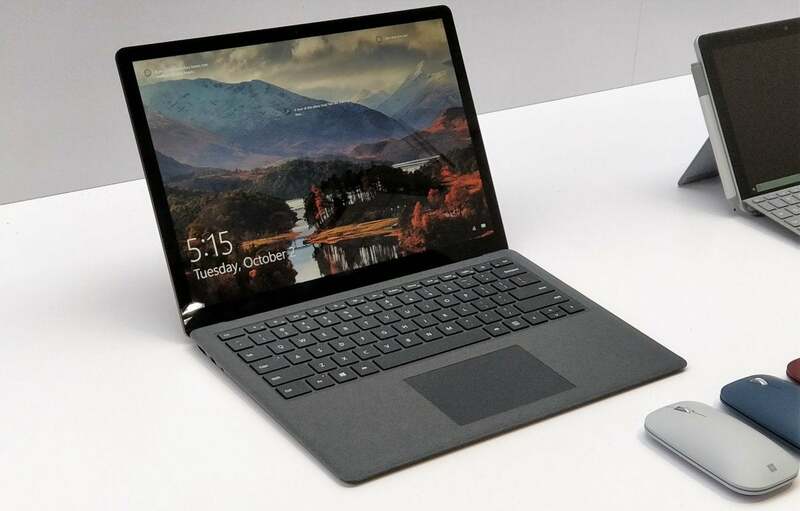 Correction: This article originally published with the premise that the lowest-priced Surface Laptop 2 and Surface Pro 6 models were available only as part of bundles with higher total costs. Microsoft has since clarified how to find the lowest-priced models, but it's very confusing. PCWorld regrets the error. The truth of those starting prices is far more complex, however. We quickly discovered that the lower price is keyed to a specific color of the devices in question: platinum. The new black, and existing cobalt blue and burgundy ‘premium’ colors will cost $100 more, but not just because of their color—they're also available only in higher-end configurations. When we queried Microsoft, the company reminded us that price difference by color isn’t new. “Since we first released Surface Laptop in the spring of 2017, we’ve been excited to offer color options on our higher-end models,” Microsoft said in a statement. “We’ve taken a similar approach with Surface Laptop 2 and Surface Pro 6. As always, we will listen to customer feedback as we look to the future of the Surface family of products.” Microsoft certainly could have noted that the starting price was for a specific color as well as configuration, however. 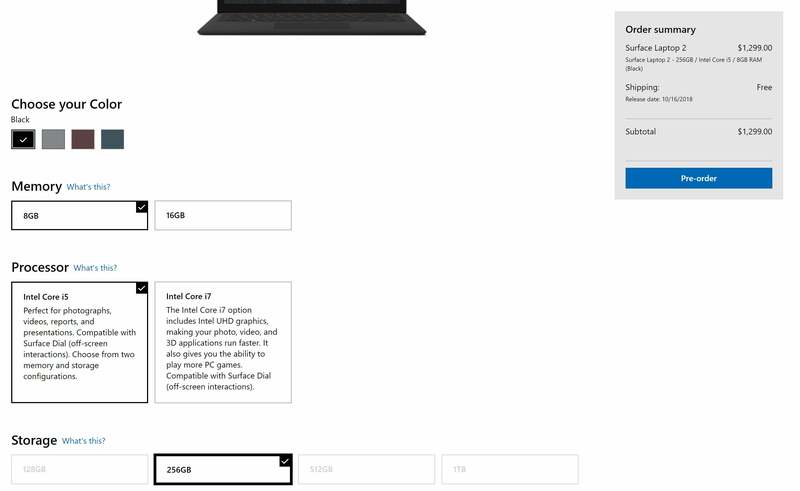 Microsoft’s Surface Laptop 2 preorder page doesn’t list a Core i5/8GB/128GB option. Instead, the “minimum” price is this $1,200 option for a Laptop 2 with 256GB of storage. Why? Because it’s in black. The confusion began when the Surface Pro 6 and Surface Laptop 2 went on sale October 2. We noticed right away that the store offered a Surface Pro 6 Essentials bundle, which required that you buy a $99 Type Cover and at least a $49.99 subscription to Office 365 along with your Surface Pro 6. 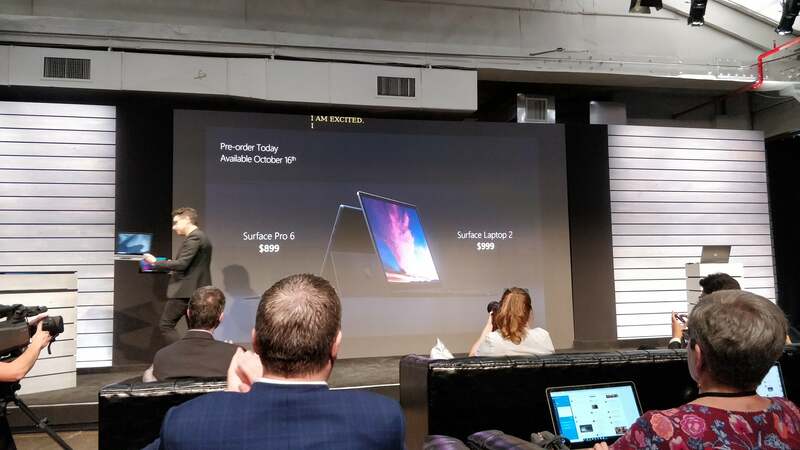 Upon further examination, it appeared that the “starting-price” versions of both the Surface Pro 6 and Surface Laptop (both with a Core i5 processor, 8GB of memory, and a 128GB SSD) were available only as part of such a bundle. 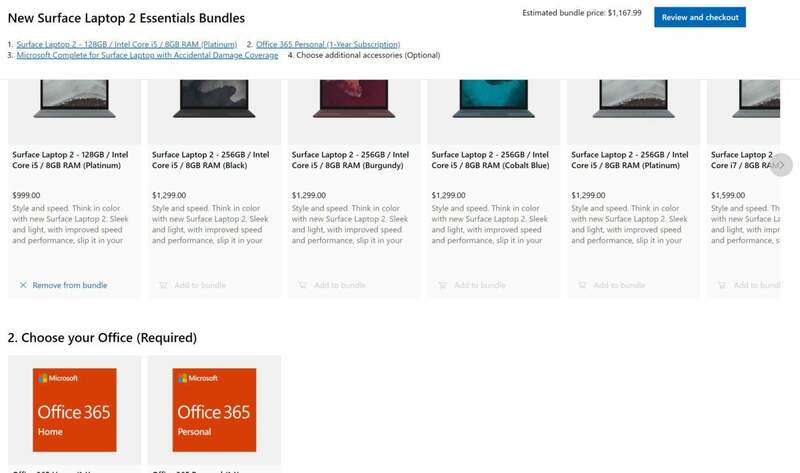 That put the bundled price for the lowest-end Surface Pro 6 at $1,167.98, while Microsoft’s analogous Essentials bundle for Surface Laptop 2 is $1,167.99. So much for the starting price. Microsoft finally started offering the $899 Surface Pro 6Remove non-product link and $999 Surface Laptop 2Remove non-product link as a-la-carte products on Thursday—in the platinum color. But the confusion continues: That 128GB storage option isn’t available in black, burgundy, or blue—only platinum. All the other colors's storage options start at a 256GB SSD. The Surface Laptop 2’s base spec is available, but only as part of an Essentials bundle...that’s in the low-cost platinum color. If that’s still not complicated enough for you, consider that there are also two different versions of the Surface Pro 6 and the Surface Laptop 2: one configured for business, and one for consumers. For the same configuration, Microsoft charges $100 more for a Surface Pro 6 for Business and $200 more for a Surface Laptop 2 for Business. (Business users and consumers must choose from the same Surface Studio 2 configurations.) Microsoft offers business customers an optimized processor with Intel vPro support, as well as a more potent warranty option, thus the price difference. And here’s what Microsoft originally promised for Surface Pro 6 and Surface Laptop 2 pricing. What this means for you: Contrary to our original impression, the starting-price versions of the Surface Pro 6 and Surface Laptop 2 are available a la carte, not tied to a bundle with a higher total price. But boy, is it ever confusing—even we got lost along the way. Just make sure to consider the various options (including color!) when shopping for either device.